Nutri Men's Multi Essentials - Premium One-A-Day Multivitamin/Mineral Formula health supplement for Men with targeted plant-based phytochemicals. 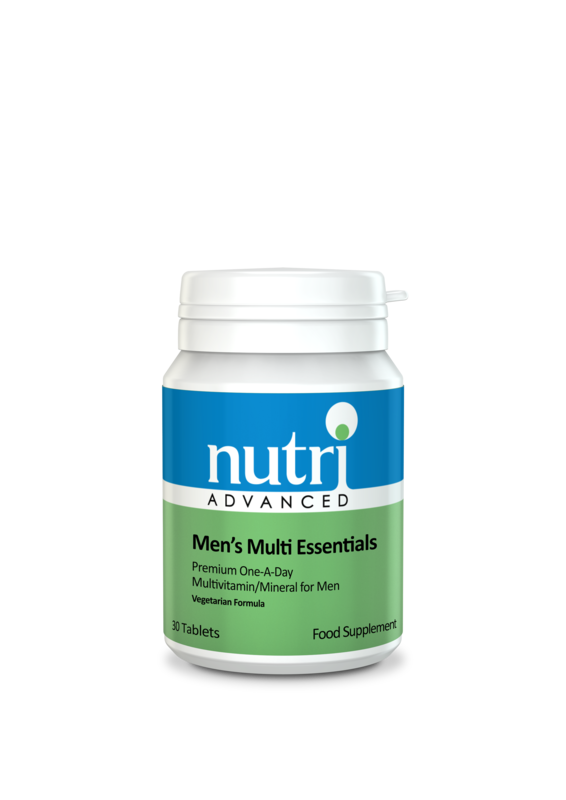 Men's Multi Essentials is a premium multivitamin and mineral formula nutritional supplement with targeted plant-based phytochemicals for men. It provides extra zinc and selenium and is iron free to specifically suit men’s unique nutritional requirements. In addition it provides phytosterols and lycopene for extra antioxidant, prostate and cardiovascular support. Premium nutritional support designed specifically for men. Provides 130mg of phytosterols to help maintain a healthy prostate. Features 5mg of lycopene to support a healthy prostate and cardiovascular system. Contains 25mg of zinc and extra selenium to support reproductive health. Provides 1000iu vitamin D3 per tablet. Vitamin D is helpful for supporting cellular health, immune function and healthy inflammatory processes, as well as supporting bone health. radicals, especially in cell membranes and other fat-containing areas of the body. body’s enzymes that provide endogenous antioxidant protection. Provides high potency, balanced B vitamins, with extra B12 and 400mcg folic acid. Features vitamin K2, an essential vitamin for supporting bone health.